The trombone is a popular instrument in school band programs. It is a metallic instrument that is usually made out of brass or brass-plated steel. 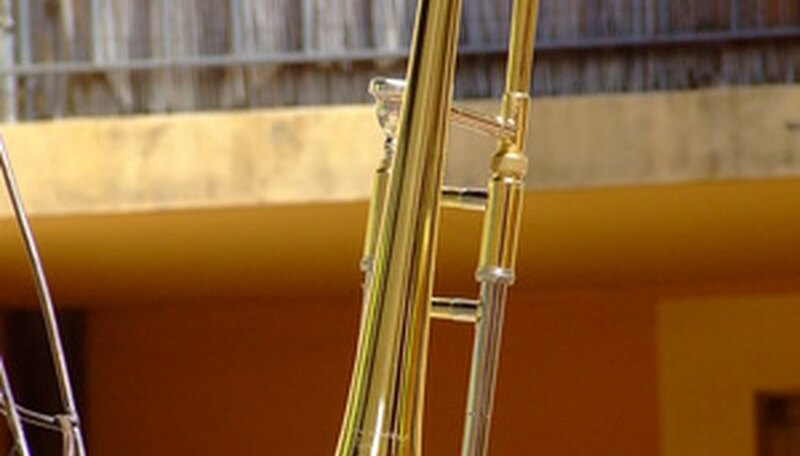 The trombone uses a mouthpiece and a slide to create sound. Trombones need frequent maintenance to function properly. The slide needs regular oiling to prevent friction from affecting sound quality, and rust can sometimes form on the brass-plated steel. Removing rust from a trombone can be done fairly easily. Apply brass cleaner to a soft clean rag and rub it over the rusted areas. Wipe it off with the other side of the rag. Apply a small amount of ketchup to any remaining rust stains and allow the ketchup to dry. Remove the ketchup with a soft rag and warm water. The acids in the ketchup help remove the remaining rust. Use fine steel wool to lightly scrape away any remaining rust from the trombone. It may scratch the instrument, but it can get off any stubborn rust spots. Repeat the above steps again when finished. Cut a lemon in half. Remove any seeds that are visible. Pour enough salt over the open end of the lemon to coat the entire surface. Rub the salted lemon into the rusted trombone surface by holding it by the rind. Add more salt, as needed, if you are covering a large surface. Wipe the trombone off with a dry rag. The acidity of the lemon combined with the salt will remove the rust. Mix vinegar, salt, and white flour together into equal parts until you have a paste. Rub the paste vigorously onto the rusted part(s) on the trombone. Let it sit for an hour. Rinse the paste off with water. Use as little water as possible, to avoid damaging the metal. Dry the instrument thoroughly with a dry rag. The remaining rust should be removed.